HOPKINTON, R.I.—Three people were hurt Thursday when a car carrier crashed into a car in Hopkinton. Police said a car carrier struck a disabled car in the climbing lane of Interstate 95 south at about 3 p.m.
EMT’s took three men to Westerly Hospital. None of the injuries was considered life-threatening. Three cars fell off the car carrier when it jack-knifed. not enough info to say but was driver on cell phone or drinking coffee or what was reason to not see car not moving was speed problem or what cars look to be subaru and truck to be fleet car and you know unions going to have hey day with this cause never happens to them!!? Holy cow carhauler1 ….. how fast did you type that reply in ? Anyway, my reply to this post is …. 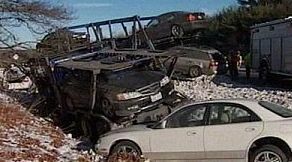 how did ‘…3 cars fall off…’ ? It doesn’t look like the rig tipped over. Did all 4 straps break off each wheel ? hahaha. this’ll open the ol’ can a worms.